Contestants needed for Bristol Come Dine With Me! 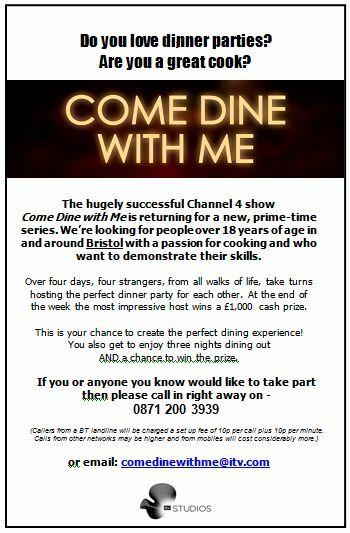 Come Dine With Me are looking for enthusiastic amateur cooks over the age of 18, who think they can throw a great dinner party and compete for the £1,000 prize. The deadline is Tuesday, 10th May (sorry for the short notice, but I only had the email yesterday!) and details of how to apply are on the poster above. One Response to Contestants needed for Bristol Come Dine With Me!